If you love peace and quiet and plenty of space. Norton Manor Estate is for you. Set in the grounds of the old manor the park is ideal for those wanting to get closer to nature. The park is approached up a long private driveway through open country fields. The estate also owns vast woodlands know as Impton Wood, where there are wildlife and private walks for the residents. Going back to 1848 Baron Greenprice owned the estate, he brought in to it trees from all over the world. You can see red cedars, Japanese maples, yew and a very old evergreen oak tree. The estate is situated just inside the Welsh border among hills and countryside. Norton Manor Estate is unique as the informality of the layout of the homes enjoy spectacular views across open countryside. The opportunity for large homes and large plots is a haven for all garden lovers. > Acres of private woodland full of wildlife* Private fishing lakes on the estate. > Residential Park Homes amongst rare trees from the barons collection. > Residential Park Homes on large plots with adjacent parking and some over looking the lake and manor house. > Automated gates are being installed. “We have lived on Norton Manor Park for 10 years and never regretted our decision to move here. Jason has always been fair with us, he did a lot of work on our home and we were more than satisfied. 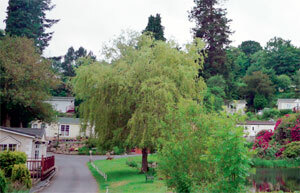 We will never go back to town life, we would miss all our beautiful views, this park is unique in its layout and also Presteigne is a lovely place to live.” Ken and Maureen Canton.